Guest author Peter Richardson invites us to look at some pages of the newly launched illustrators, a quarterly magazine celebrating the greatest UK and European illustration of the past 150 years. 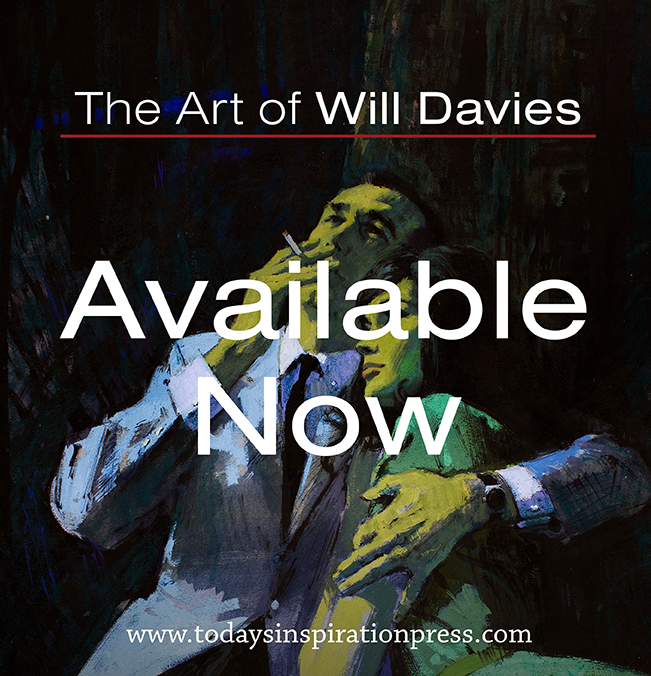 The publication has been a long time in reaching fruition: the idea stemmed from a series of discussions I had with publisher Geoff West, the owner of Book Palace Books. I had produced a couple of art books with Geoff, which had been very well received, and we were brain-storming somewhat along the lines of, “wouldn’t it be great if we had the time and resources to produce great art books on all the illustrators we love”. 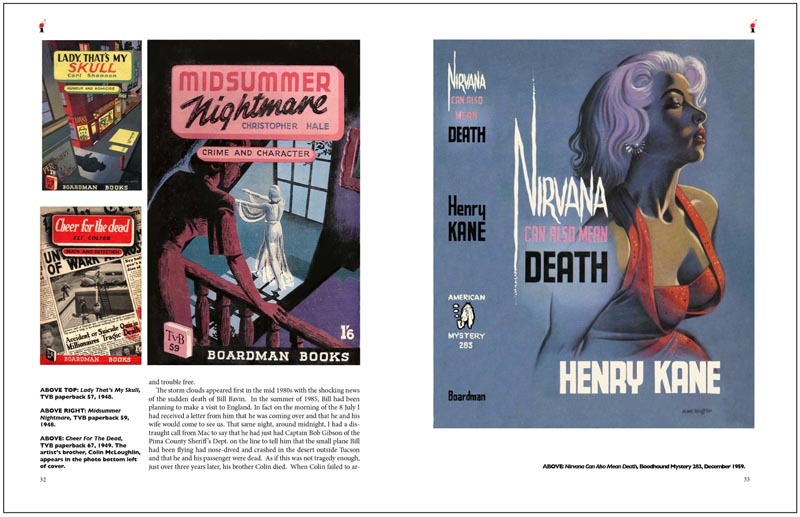 We didn't have the time or resources to produce additional specialist books about individual illustrators, which is how the idea for the magazine originated. We decided to produce a quality magazine, featuring four or five illustrators an issue, with the memories and stories of the artists, and how their work came into being, during what was the start of, and latterly, a renaissance for the printed image. Our intention is that the magazine should become the most comprehensive reference work on the world's greatest illustrators. It was Geoff who suggested a quarterly publication as being a really effective way to circumvent some of the hurdles, and very importantly, allowing us to share artist’s work which probably would never be examined in any other format. We had seen what Dan Zimmer had achieved in his excellent Illustration quarterly, and knew that we could achieve similar results with our publication, which, in contrast to Dan’s, focuses on work from Europe and the UK. 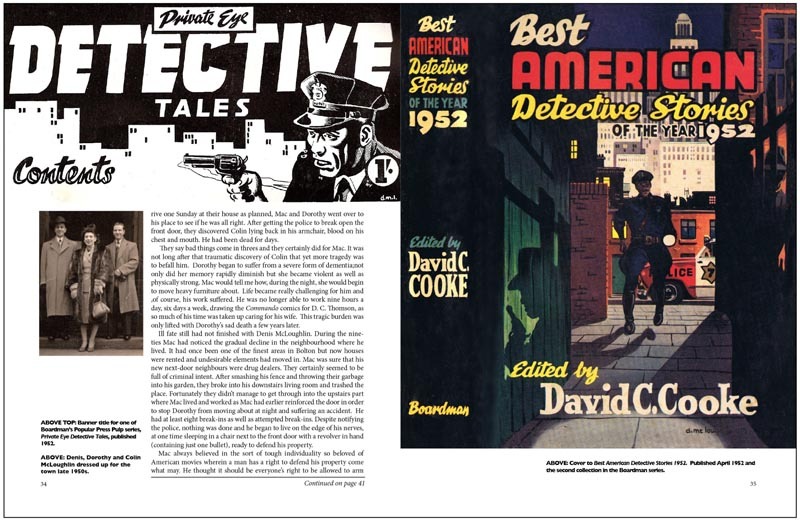 So we have a clearly defined editorial mission statement: To feature the greatest UK and European illustration of the last 150 years, as well as the occasional article showing some of the best of American illustration. 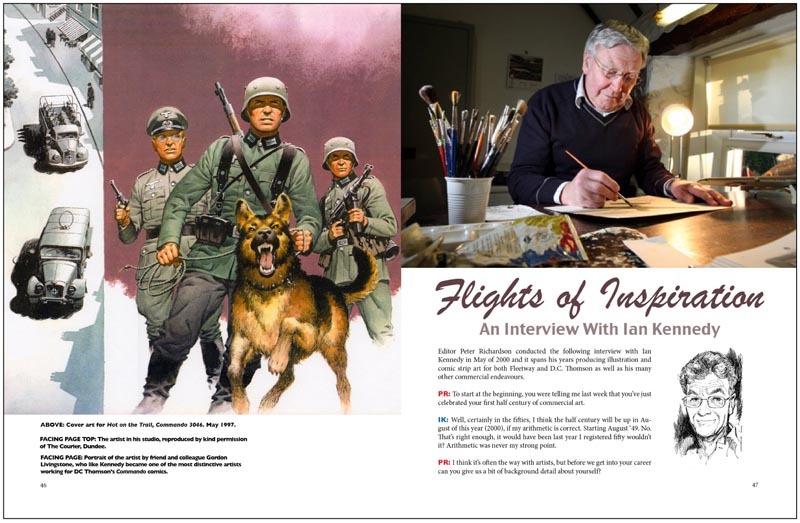 Our first issue leads with a feature on the work of Denis McLoughlin - whose illustrations you've been enjoying so far in this post. 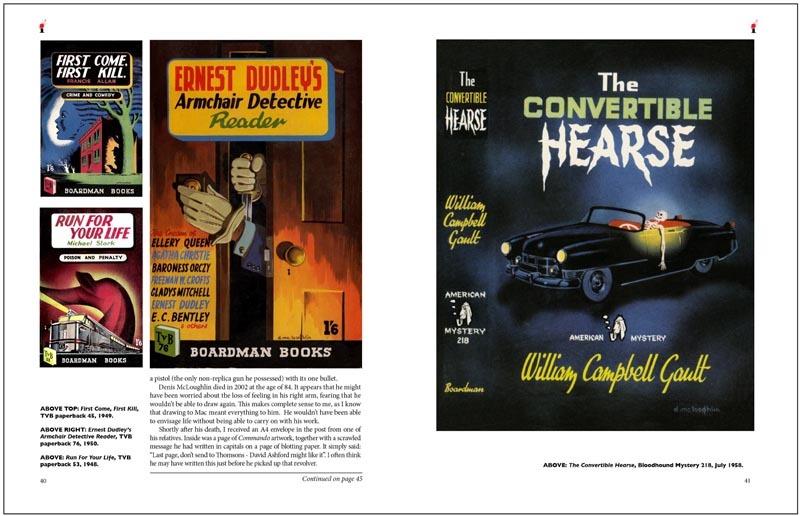 McLoughlin was one of the UK’s greatest purveyors of ‘noir-style’ book jackets. 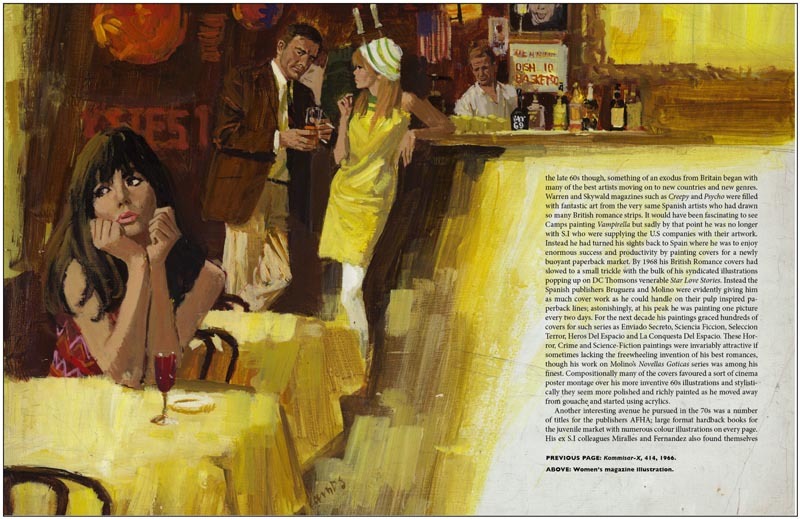 His work, in it’s handling of lighting and cityscapes, is reminiscent of Edward Hopper, but in addition, he was a consummate designer, whose dedication to his craft was such that he treated the lettering of all his covers as an integral part of the image, and as such his work retained a unity of purpose that none of his contemporaries could hope to achieve. 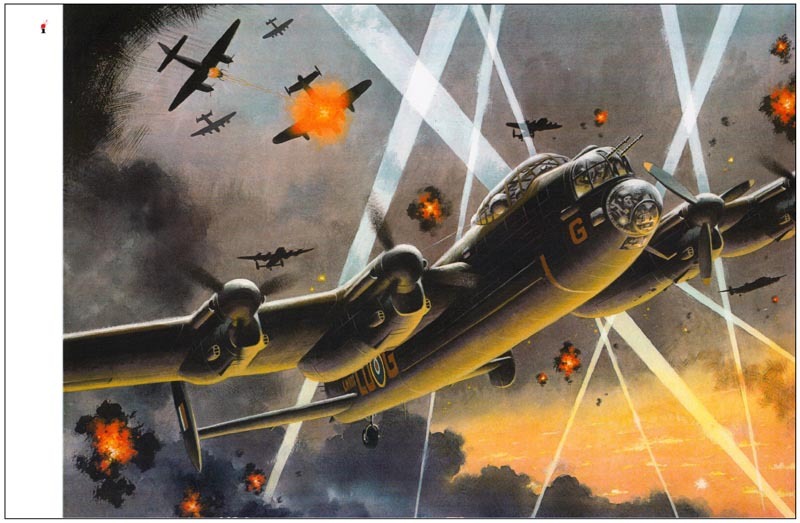 We also look at the work of Ian Kennedy, one of the UK’s foremost boy’s fiction cover artists. Kennedy's love of aeronautics has informed so much of the work he has produced over the last sixty years. 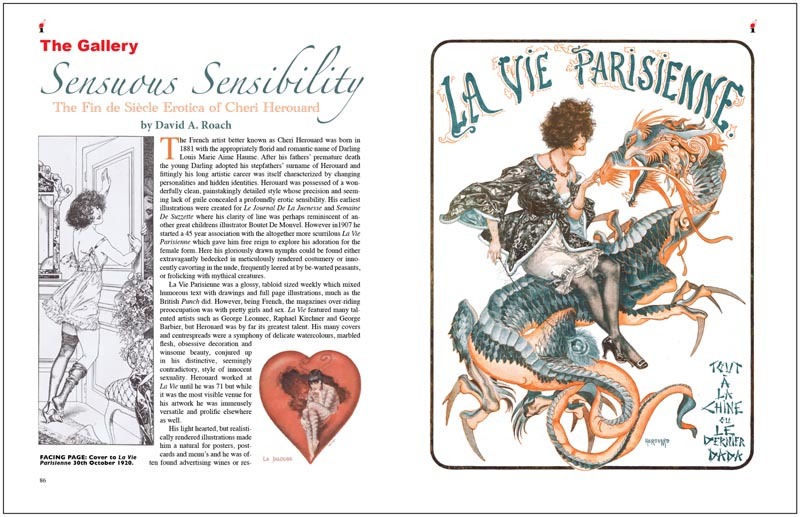 ... and going further back to the dawn of the last century, we look at the delightfully coy eroticism of the Parisian illustrator Cheri Herouard. 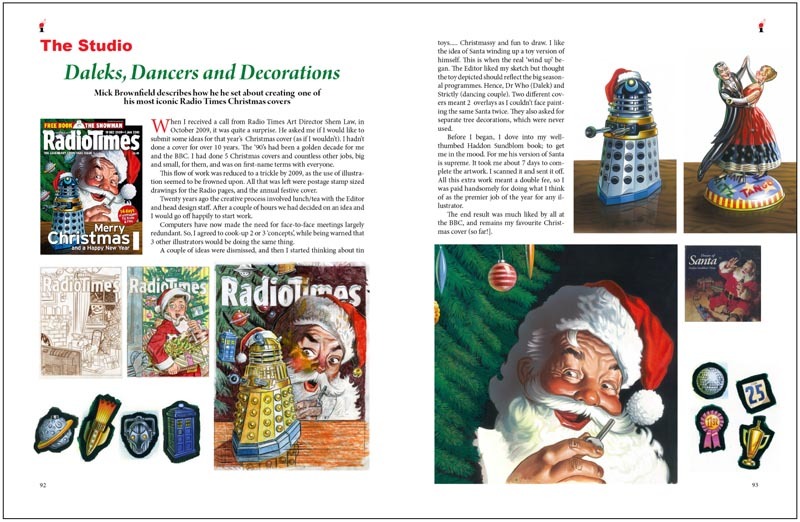 Bringing us back to the here and now, one of the UK’s highest profile illustrators; Mick Brownfield shares some studio secrets, when he reveals how he set about creating one of his most memorable Christmas covers for Radio Times covers. Our first issue is now on sale, and I am pleased to say that the response has been far more positive than even our most optimistic projections had allowed for. However, we are by no means complacent: it is our intention that each issue of illustrators should be strong, distinctive and memorable, so that the reader’s’ expectations are not only met, but exceeded. To this end, we are trying to avoid the pitfalls of becoming too closely identified with any particular genre of illustration, and hopefully this will become apparent as illustrators gets into it’s stride. Unlike the excellent'Illustration' this magazine seems to lack specific focus and jams together a bunch of completely unrelated illustration styles and eras.Badia Camps seems to be on theme but the other artists are very peripheral. 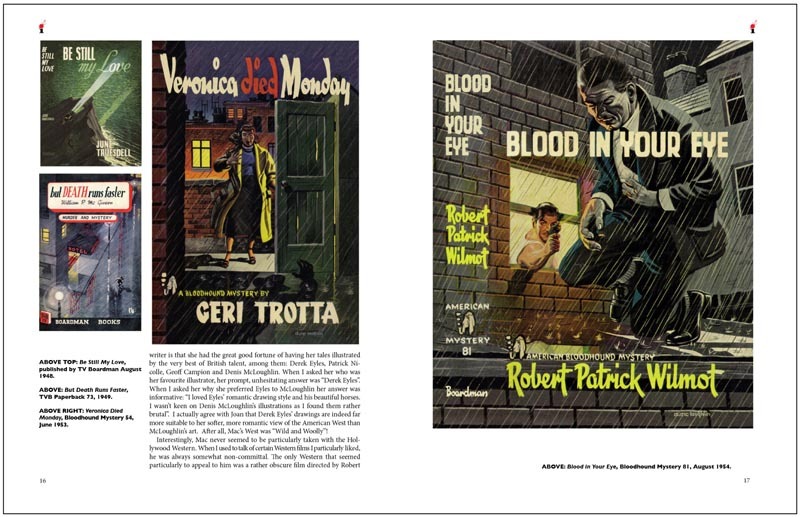 Alex; choosing a random issue of Illustration - say issue #7 - we are treated to a look at the 1950s movie poster art of Reynolds Brown (Attack of the 50 Foot Woman), next we find an article on Frank Schoonover, who's heyday was perhaps the 1920/30s. "They Drew on Stone", an article on what appears to be late 1800s sheet music cover illustrations follows Schoonover. Last is an article on 1960s and '70s Revell model box art. I'm not sure I see the point of your criticism. Can we perhaps give this new publication a chance rather than pass arbitrary judgement on their first issue based on one brief blog synopsis? Personally, I'm thrilled that there will now be one more source of in-depth information about the history of illustration - expanding our appreciation of the art form beyond the traditional North American borders. Let's celebrate rather than criticize. These guys deserve our support and encouragement. I think its actually more expensive than the other magazine. Leif; It seems that the introduction of the UK Illustrators magazine is timely as Alex, whomever he may be, is in need of some enlightenment about publishing, and indeed, illustration. I think the telling line in Alex's first comment is, "Badia Camps seems to be on theme", which indicates to me that Alex has already pre-determined what the theme of Illustrators should be and that the rest of the content of issue 1 doesn't meet his self appointed editorial strictures. Criticism is always welcome and even if we don't agree with it, we do listen. But as Leif has already pointed out and Alex has neatly skipped addressing in his reply; is that producing a journal such as Illustrators is a very interactive undertaking when such a project is still in it's infancy. You are to a certain extent guided by the desires of your readership, which is why Dan's Illustration was so eclectic in it's early days. We are going through the same procedure. We do have a very definite editorial agenda, which is quite simply to celebrate the work of the greatest UK and European illustrators from the last 150 years, with insightful and well written features by people who are passionate about their subjects, illustrated by some of the finest examples of each artist's work that we can bring to the reader. 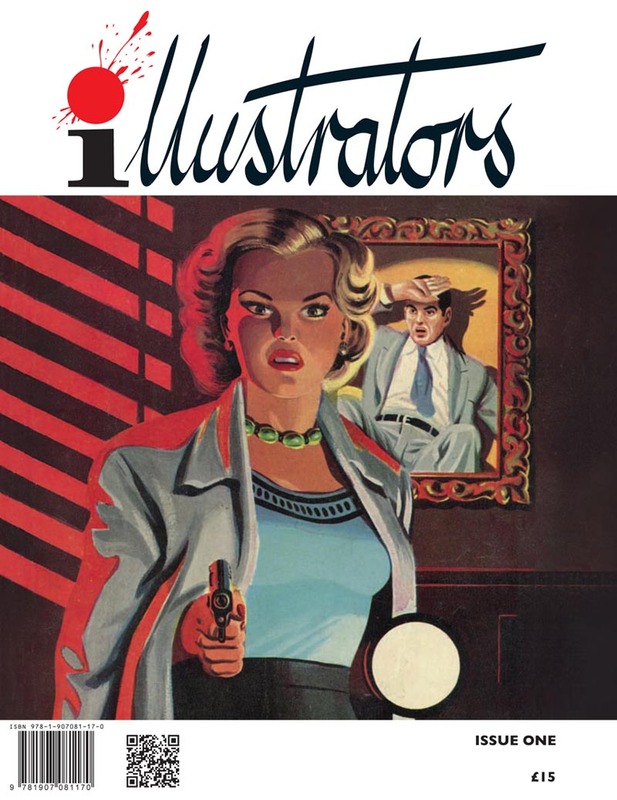 I got the first issue of Illustrators magazine mainly for the Ian Kennedy article but the ones on McLaughlin and Badia Camps were excellent as well. And to call someone with the talent that Ian Kennedy has "peripheral" is (and I'm trying to find the kindest expression I can think of here) misguided. I got the first issue. Have only ever read the Fuchs and Peak issues of 'Illustration' so can't make too much comments as to how it compares to 'Illustrators'. So far I am very happy with the journal, have flicked through countless times, and started on the McGloughlin piece, which so far is good. I love that there's a real mixture of styles in there, it means I'm going to learn more about the industry as a whole and not just one caveat; it keeps the mind open and objective.